BEIJING - It might be a little sad as Dmitry Sautin ended his Beijing Olympics with a fourth place in the men's 3m springboard. However, with eight Olympic medals, including a silver in Beijing, the last Olympic Games for the legendary diver is good enough. In Tuesday's men's 3m springboard final, the Russian diving icon made six solid dives, especially the last one. Sautin made a 5353B, reverse 2 1/2 somersault 1 1/2 twist in pike position, which gained 99.75 point, the highest of his six dives and also ranked second in the round. Chinese diver He Chong led all the way to win the gold, while Canadian golden boy Despatie took the silver. The bronze went to Chinese Qin Kai. "I performed normally, and the score was good. I'm satisfied with that, and I've tried my best. Although I made some mistakes, I finished the competition respectable." "I'm very satisfied with the Beijing 2008 Olympic Games, at least we got a silver medal," said the 34-year-old Sautin, who claimed a silver medal in synchro 3m springboard with partner Yuriy Kunakov on August 11. "Chinese divers are always strong," said Sautin, who has already collected eight Olympic medals. "They have a strong team." Beijing Olympics will be the last Olympics for Sautin. "I had decided to give up diving after 2004 Athens Olympics, and I injured my shoulder in 2005. But after my injury was healed, I found I still wanted to dive, and I found a good partner, so we began to participate in competition together." "Now I am at Beijing Olympic Games, and it's fantastic," he said. "But it should be my last." The "diving czar" has always been an tough challenger to Chinese in the past decade. Starting diving at seven, Sautin won his first Olympic medal at the age of 18, as he took the bronze in the men's 3m springboard event in the 1992 Barcelona Olympic Games. 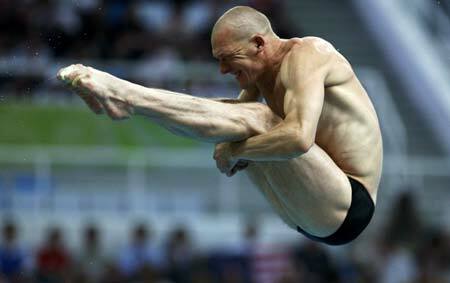 At 22, Sautin became an Olympic champion as he clinched the gold of the 10m platform event in the 1996 Olympics. Sautin took four medals in the 2000 Sydney Olympic Games, one gold in 10m platform synchro, one silver in 3m springboard synchro, and two bronzes in 3m springboard and 10m platform respectively. Sautin suffered an injury to his left knee in early 2003 which disrupted his preparations ahead of the 2004 Olympics. At 30, He tasted a disappointing Olympic trip in Athens, in which he struck the board on his way down from a dive and finished only seventh in the 3m springboard final. Sautin has also participated in the world championships for five times, and claimed nine medals. He has never tried to avoid talking about his age. "I felt very tired, and the competition became harder and harder year by year. I'm older than the other divers, and they are very good young people, especially the Chinese," he said.